I came across this photo today and it made my heart sing. It seems like a perfect purple and white day to me. If you knew how much my soul needed this today Laura!!! Can I steal this photo - with full credit of course - for my post? It made my heart sing too! BEAUTIFUL!! Waiting for lilacs to bloom here. Oh my goodness, isn't that gorgeous! So very spring-like. sigh. Believe it or not, that lavender color is about the same as the trim on my white house! Everyone seems to like it too. I can just imagine how wonderful it smells, too. Guess what...I'm wearing purple and white today! heehee! That is just gorgeous! I need more purple in my life! I saw a glimpse of that in my bloglovin feed, and I thought...oh she has wisteria already? But still a great shot. Thanks I needed that gorgeous photo! Can't wait for my lilacs to bloom. My heart is joining yours in song. Lilacs are one of my favorite flowers, and usually bloom during my birthday, the first week of May, so I consider them a special gift each year! 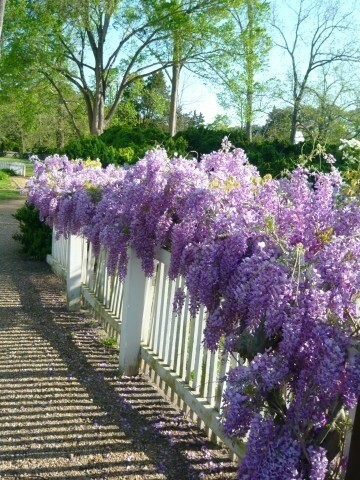 Wisteria on a white fence is just what I needed to begin my day! Wisteria is lovely. I highly recommend visiting the Gamble Garden in Palo Alto. They have a courtyard with about 8 standard wisteria trees. In the summer, with the bees humming around them, they smell like blueberry & bubblegum. 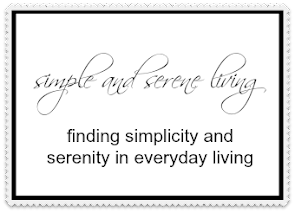 It's an amazing fragrance. We had some wisteria growing near our rental cottage (that we lived in when we first moved out here.) It was somewhat hidden, but I loved knowing it was there. Wish I had some here!